Dublin Physiotherapy is a clinic specialised in offering solutions for people who face pain and movement dysfunction, providing rehabilitation services for Multiple Sclerosis, post-surgical cases and Parkinson’s Disease. Co-founder and chartered physiotherapist, David Fitzgerald is a practising clinician for almost thirty years, specialised in the rehabilitation of chronic musculoskeletal problems. To help people understand what provokes them pain, David produces short videos addressing everything to do with back, neck and spine pain and many more pathologies. The video below addresses coccyx pain (also known as tailbone pain and lower back pain) and everything you need to know about it. Coccyx pain is known in medical language as coccydynia or, in simpler terms, as tailbone pain, and it can be quite painful. It usually affects people in making it very uncomfortable for them to sit down, becoming a quite debilitating condition. The groups of people mostly affected by it are women who have just given birth or people who suffered a fall. In the first case, women who have just given birth, usually suffer from coccyx pain during the pregnancy or post labour, due to the passage of the baby through the pelvic floor, causing a strong pressure on the coccyx and a strain on the ligaments and muscles attached around the pelvic floor area. The second group David mentions is people who suffered a fall, typically onto the buttocks. Most of these cases are caused by a bad fall on a staircase, sliding on a slippery surface or missing a step and sliding a landing. All these usually cause a pretty bad landing onto the buttocks, in which case the direct point of contact is through the coccyx. David explains coccyx pain in a very practical way, showing his audience a picture of the anatomy of it, which you can see below. You can see the pelvis area and the two hips on each side, with a middle triangular bone called sacrum and, in the red circle, the coccyx. It is a small “curly bone” which is essentially the remnants of what would have been your tailbone. Your lumbar spine is located near the coccyx and the many ligaments which attach from the side of the coccyx to parts of the pelvis, as illustrated by David in the video. What he wants to highlight in the video, however, is not just the main effects resulting from a fall onto the coccyx, but also all the secondary effects caused by the correlation between the coccyx and the pelvis areas. The direct contact with coccyx, in fact, is known to cause bruising or irritation of the ligaments, but it can often result in a displacement or position change of the sacrum. It’s then important that when a patient suffers from coccyx pain, the pelvic position and the pelvic and sacrum are all examined, in order to exclude any serious damage. Irish Health offers some good insights for people who are still hurting after suffering from tailbone pain or lower back pain. Whilst the pain is very similar, coccyx pain related to pregnancy or post labour has very different causes and requires a very different treatment. Suffering from coccydynia is usually due to some issues in the pelvic floor, which can only be tackled by specialists, such as physiotherapists, dealing with pelvic floor rehabilitation. Women suffering from low back and coccyx pain also suffer from incontinence or other pelvic floor dysfunctions, causing very often embarrassment, resulting in patients who would rather live with the pain than talk to a specialist about it. Some of the side effects of coccyx pain, such as incontinence, are not always related to the bone. During the third trimester of every pregnancy, in fact, muscle tone switches off, leading the muscles to loosen up and become excessively elastic. This then becomes more of a psychological problem, as women feel overwhelmed by the rehabilitation, having to rest and unload the tissues, while they also have to look after the new born. Trying to feel relieved from coccyx pain becomes just another chore to be added to the daily list of things to do and simple things, like sitting comfortably to eat or watch TV, become something much more difficult. If you suffered a tailbone pain injury, then another important thing to check is the mobility within the sacroiliac joint (two joints formed by the conjunction of the sacrum and the iliac bones), which sometimes can get jammed. This is one of the possible secondary effects, resulting in people finding it uncomfortable to sit and having to try everything, such as sitting off-centred, to feel a slight pain relief. The lack of comfort when sitting is usually caused by the pressure put on the sore coccyx when resting all our weight on it. The treatment, in this case, is trying to re-orientate and realign the joints and ligaments in an effort of relieving them from the pressure. 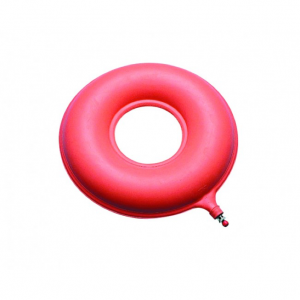 The standard treatment consists of using a special ring cushion (you can see one below) to take the pressure off the coccyx and allow the patient to sit more comfortably. Dublin Physiotherapy is amongst the centres providing tailbone pain treatment in Dublin. Resting is extremely important to fix this problem and, to speed up the process, systematic examination and manual therapy are fundamental to realign the joints and distribute the pressure property. If you suffer or used to suffer from coccyx pain, then you will know that very often you can get episodes of muscle pain around the region affected; we’re usually talking about gluteal, hamstring, quads and abdominal muscles. This happens because the tension in them gets disturbed and usually turns into overactive, causing muscle spasms. According to The Irish Times, most people who suffer from tailbone pain injury don’t take it seriously, increasing even more the risk of side effects. Turning to an expert, like Dublin Physiotherapy, when you’re suffering from coccyx pain is the best thing to do and the sooner you do it, the faster you will be able to recover from your condition.